About 17 percent of children younger than 19 are obese — that’s 12.5 million people, according to the Center for Disease Control and Prevention. The Junior League of Greater Orlando wants to change that by inspiring and educating families on the importance of being healthy. The organization hosts its fifth annual Fit-n-Fun Fest from 10 a.m. to 2 p.m. on Saturday, March 3, at south Central Park in Winter Park. The event will feature more than 40 exhibitors, free giveaways and nutrition professionals. Allison Hudson, president of the Junior League, said lack of access to healthful food, as well as food education, is a problem that leads to poor food choices. “The kids can go home and tell their mom ‘Hey, we need to eat healthier!’ but unless you get that parent in there learning why they need to eat healthier, it’s a hard cycle to break,” she said. Her organization is advocating for Florida Senate Bill 852, titled the Healthy Food Retail Act, which would aim to improve access to healthful food through the Department of Agriculture and Consumer Services. It would establish a financing program to help fund projects that increase access to fresh fruits and vegetables in underserved areas, according to the bill summary. Hudson cites the issue of “food deserts,” or areas that are without proper access to healthy food, as an issue that affects nutrition. “They may not have a supermarket close to them — it could be more than five miles away — there’s no bus route to the supermarket, so a lot of these kids are filling up on junk food because they have a McDonald’s or whatever near them,” Hudson said. Dr. Scott Graves, a naturopathic doctor, practices a form of medicine that focuses on the healing power of nature and the body’s own capacity to heal itself. Graves says that although exercise is important, a good diet is absolutely critical to personal health, and parents are the key to providing that for children. Cut the apple into four wedges, and remove the core. Trim the cheese slices to make triangles resembling sails. Thread the cheese triangles on wooden toothpicks. 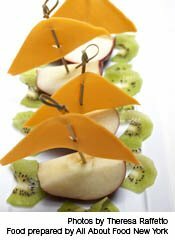 Stick the toothpicks into the apple wedges for sails. 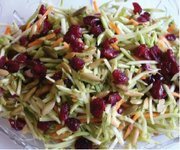 Recipe source: Food 4 Life, The Junior League of Greenwich, Conn.
Open bag of broccoli slaw. Dump slaw, craisins, bacon and pumpkin seeds in bowl. Pour dressing over slaw. Toss well. Note: This recipe is best if it sits in the fridge for a couple of hours and is tossed again before serving.